You just need to enroll your policy details after the creation of user on LIC site. If you have purchased a policy for your spouse, children then you need to create separate user-id on LIC site. Let’s go through the entire process of checking policy status on LIC site. Follow simple steps given below to register online on LIC portal to check policy status. Next screen is for the password. Please ensure password contains at least one numeric character and it is greater than 8 digits. Once you are registered kindly login to LIC portal with user id and password. After login from the right side menu click on Policy Tools à Enroll Policies. Enter Policy Number, premium amount and Name of life insured and click on enroll. For Policy status click on policy number, for getting Vested Bonus information, click on the link in the column “Vested Bonus”. You can also pay LIC premium online by clicking on Left side menu Pay Premium Online. How to check LIC policy details via Phone? If you don’t have internet access, you can check LIC policy details via phone. To know Policy details through IVRS, simply dial 1251. This facility is available 24×7 in selected cities. To know Policy details through IVRS, simply dial 1251. This facility is available 24×7 in selected cities. 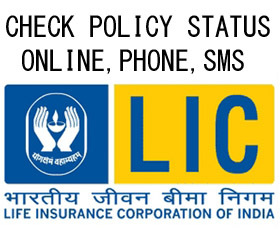 How to check LIC policy status via SMS? You can get your LIC policy status and other information via SMS by sending SMS to 56767877. Your SMS will be charged as per your mobile operator and selected plan. This option will be expensive as charges applicable here are from 3 Rs/- to 10 Rs/-. Have you ever check LIC status online? Do you have LIC portal user id? Have you made LIC policy premium payment online? What is your experience do share your views! If you have any queries related to LIC policies, feel free to post in comment section. « How to calculate Gold Ornament Price? WANT TO KNOW POLICY STATUS. POLICY NO – 458459402. NAME- MAITREYEE DAS. be done as my Policy is not tracebale. What isw the maturity amount. You need to contact nearest LIC office. They will tell you to give advertisement about lost of LIC policy in news paper.Once you give advertisement and if you can’t get any response in 1 month, you need to contact LIC office to get NOC for your request. After NOC process is over you will get duplicate LIC policy.